What Size Powder Spray Booth Do You Need For Your Operation? Home » Latest News » What Size Powder Spray Booth Do You Need? What Size Powder Spray Booth Do You Need? Just like with your powder curing oven, your powder spray booth needs to be large enough to accommodate either the largest product you will routinely be coating or the largest batch of products you must coat in order to meet your shop’s throughput requirements. Your booth may need to be a bit larger than your oven if you are dealing with large parts, or it may be possible to use a smaller booth if you coat multiple small racks of parts before curing them all in one large batch. Regardless of the booth’s size, you need an appliance that is large enough to hold your products and provide enough space for the operator(s) to move and work efficiently. Although this article focuses on batch coating processes, many of the concepts also apply to powder coating in a constant-process environment where parts are moved via conveyor instead of on rolling racks or carts. With both batch and automated lines, it is not uncommon for booths to be open-faced or to have ware openings instead of doors that seal the parts inside the powder coating booth. Unlike with conventional wet paint processes, contamination by airborne dust or debris is usually less problematic when powder coating. During powder application, the powder that does not adhere to the part is called overspray. Overspray generally falls to the ground or is moved by the booth’s airflow and pulled into the filtration system, but only if the powder is sprayed inside the booth while the exhaust is operating. Spraying powder outside the booth or away from the filters can lead to powder contamination of nearby appliances (including your curing oven). The airborne powder is a nuisance dust that can travel throughout your workspace. When sizing your powder spray booth, make sure that the booth is large enough to completely enclose the largest product you’ll be coating. This ensures that all the powder is being sprayed inside the booth, which eliminates powder contamination of the shop environment. 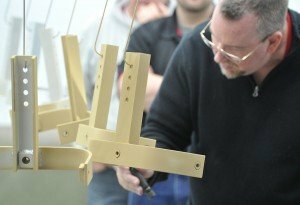 The largest product you are coating should easily fit inside the booth with extra room for each operator to both move himself and the powder coating gun around the part. Adding additional space gives your operator adequate room to work without jostling or bumping the product that is being coated. Prior to curing, applied powder media is fairly easy to remove. Any accidental contact with the part will require touch-up if not a total rework. Besides adding room for the painters, you also need to allow room for your racks. Let’s say you have a 6’ tall part and you want to coat it in an 8’ tall booth. If the rack and hook cause the part to hang about 1’ from the ceiling of the booth, the painter is going to end up having to paint a portion of the part that is only 1’ off of the floor. To do this effectively can be slow and tedious, and this type of cramped working space contributes to fatigue. Another issue is maintenance. In the scenario above, the top surface of the part being coated is only 1’ from the ceiling. This means that the booth’s ceiling and ceiling-mounted lights will be coated with powder overspray. After an hour of painting, the lights will have a film of powder over them—reducing illumination in the booth and causing the light coming from the fixtures to be tinted by the thin layer of powder as it passes through. This makes it harder for the painter to gauge coverage. Greater contamination by overspray also translates to greater cleaning costs and more down time as the booth must be frequently cleaned with compressed air or wiped down. The same problem can occur when spraying parts that are too close to the walls. It’s easy to dislodge accumulated powder and contaminate fresh parts, especially if the old powder on the wall is a significantly different color or gloss compared to the powder being applied to the parts. 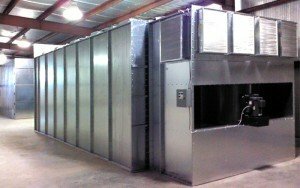 If you are going to be using a single large rack per batch, we recommend that the powder spray booth be an additional 2′ – 6′ wider than the matching powder coating oven. This gives your painters room to work. We also suggest that you consider a booth that is 2’ taller than your oven to reduce cleaning hassles associated with powder covering your light fixtures. One of Reliant Finishing Systems’ most popular batch equipment packages is sold with an 8’H x 8’W x 25’D (interior) curing oven and an 8’H x 10’W x 25’D or 10’H x 10’W x 25’D (interior) powder spray booth for this very reason. Make sure you have enough available floor space to put the right size booth in your facility. 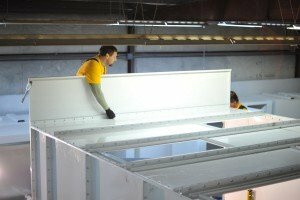 Note any low ceilings, structural supports, posts or columns, or other obstructions that might restrict where your powder spray booth can be installed. 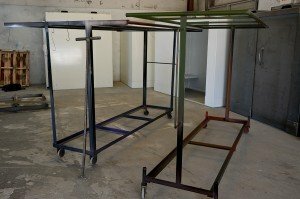 Carefully planning the layout of your booth, oven (https://www.reliantfinishingsystems.com/powder-coating-equipment/powder-coating-ovens/) and pretreatment appliances before you buy them can prevent headaches later. While the overall footprint of most powder booths is similar to their listed interior dimensions, there are a couple things to keep in mind. Every powder spray booth comes with at least one integrated, attached or separate exhaust chamber that houses the filters and the exhaust fan system. Depending on the powder spray booth’s configuration, these exhaust chambers are attached to the rear of the booth or to one or both of the side walls. These exhaust chambers usually add an additional 4’ to 5’ of depth if attached to the rear, 4’ to 5’ of width if a single side wall has an exhaust, or 8’ to 10’ of additional width if both walls have exhaust units attached. As an example, a standard model PSE81025 from Reliant Finishing Systems is a powder spray enclosure that is approximately 8’H x 10’W x 25’D inside. It comes with an exhaust chamber that is built into the rear of the booth enclosure. The overall exterior length of the booth is 28’10” including the exhaust unit. The header panel adds approximately 2′ of extra height to the front of your powder spray booth. Another space consideration is the header panel. The header panel is usually about 2’ tall and is added to the front of spray booths in order to keep airborne powder from drifting over the top of the booth and into the light fixtures. The header also assures that the light fixtures are adequately isolated from the booth interior to meet national codes, such as NFPA 33. The header panel is installed on the very front of the spray booth, above the main opening, and is typically only a couple inches deep, so you won’t have to account for its additional height over the entire appliance. In addition to the total exterior dimensions of the powder spray booth, we suggest that you allow for at least 3’ of clearance around the booth in order to make installation and maintenance less costly and to meet common codes and regulations once the booth is installed. The type of powder spray booth you decide on can also greatly influence your powder coating system’s layout and workflow. Reliant Finishing Systems provides three different configurations of powder spray booths, shown below. A STANDARD powder spray booth has an enclosed cabin with a filtered back wall. Many batch powder operations use standard booths and install them side-by-side with their powder coating oven (again, allowing for at least 3′ between appliances and the walls). Remember: Some companies, especially those that primarily deal with wet paint booths like those used in automotive body shops, this design may be called a “crossflow” configuration to differentiate it from “downdraft” designs where the air travels from the ceiling into a metal basement or excavated pit under the booth before being exhausted. Shown: a crossflow style powder spray booth. A crossflow style booth has an exhaust chamber on one side wall. A double crossflow would have an exhaust chamber on both side walls. A CROSSFLOW powder spray booth usually does not have a back wall. Instead, it has the exhaust filters installed on one side wall. This creates a tunnel-style configuration that allows you to move whatever you are coating in one end and out the other. A DOUBLE-CROSSFLOW powder spray booth is also tunnel-style booth. It is similar to a crossflow configuration, but has an exhaust system mounted on each side wall. One benefit of this design is that it allows the painter to stay clean and work quickly. He can move the rack slightly and always be painting into the exhaust filters—as opposed to spraying powder onto the part while the exhaust is behind him, causing the overspray to cover him as it is pulled out of the booth by the fan. A double-crossflow booth also allows two painters to work effectively at the same time, especially when the exhaust units are mounted in a diametrically-opposing position. In that configuration, each painter deals with only one part of a large part or rack full of parts and is always spraying into the exhaust filters. As the rack moves through the booth, each painter sprays only a designated portion of the parts being coated. In nearly all types of automated systems, a tunnel-style powder spray booth is paired with a tunnel-style powder coating oven with track running through both appliances so a continual coating process can be maintained. In a batch setting, the booth configuration should help improve coating workflow and maximize use of available floor space. Another thing to consider when planning for your powder spray booth (and your coating line in general) is staging. 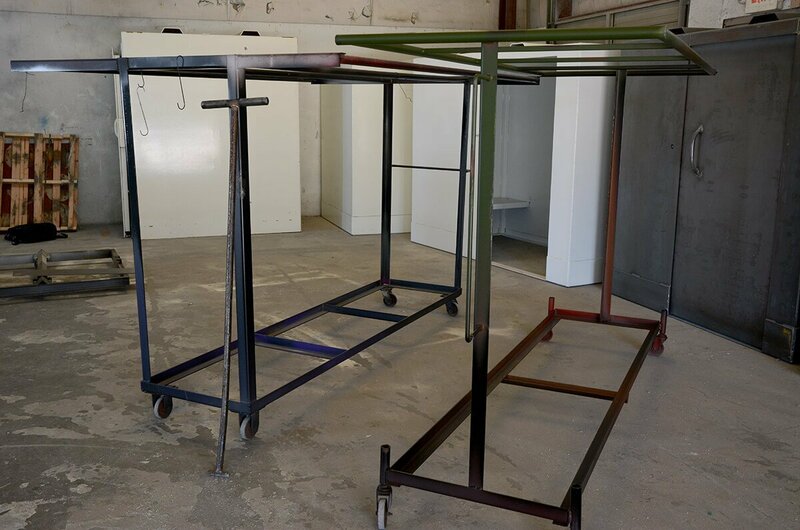 A staging area refers to the additional shop space you’ll need for storing racks and parts as they move through the pretreatment, coating and curing processes. Even if racks are only going to be parked in a spot for a few minutes, it is important that the spot is clearly defined and kept clean. 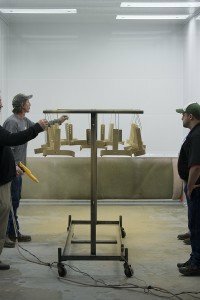 Make sure you have a staging area where the parts can be prepared before they enter the powder spray booth. Whether you use blasting, chemical pretreatment, or simply a wipe-down before the parts are coated, you need to be able to stage parts after they’ve been prepped. This staging area is where your racks will be loaded with clean products, and may be where empty racks are returned. This staging area needs to be large enough to accommodate at least one typical batch of products. 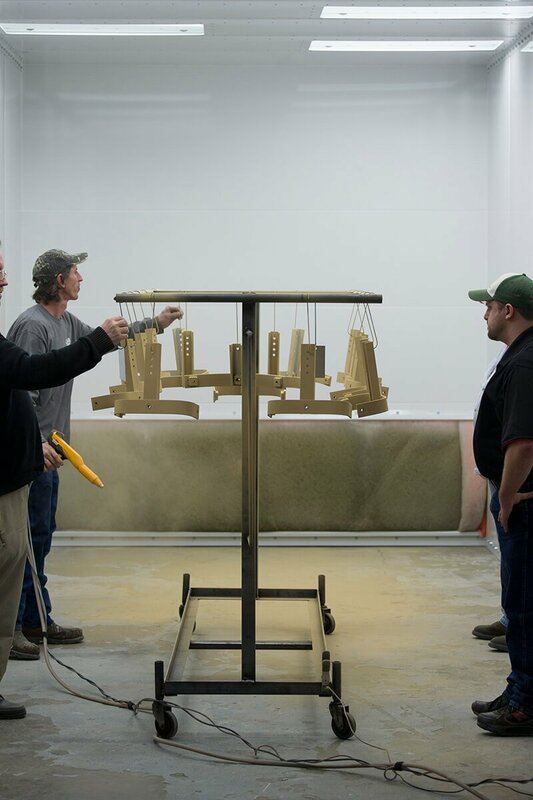 In some batch operations, a second staging area is placed between the powder spray booth and the curing oven. In most batch operations, the powdered parts go directly into the curing oven. But, if your coating throughput is very high or you’re curing something that requires a long dwell-time, you may need this second area to store your previously coated parts away from shop traffic before they are placed in the curing oven. IMPORTANT: Don’t let your powder coated parts wait too long before curing. Powder does not immediately fall off once a part has been coated. Good adhesion isn’t hard to achieve as long as you have a proper ground during application. Typically, uncured powder coating will adhere to the part for several hours with no ill effects. However, the longer you leave the powder uncured, the more exposure it has to moisture, handling damage, dust and airborne contaminants that cause imperfections in the cured finish. Once you remove the cured objects from the oven, the racks and parts must have a place to cool before being handled. This final staging area is where the parts can adequately cool before assembly or packing. It’s very important to stage cured parts away from pretreatment areas and powder spraying operations to prevent accidental contamination of the powder finish before it has cooled and fully hardened. 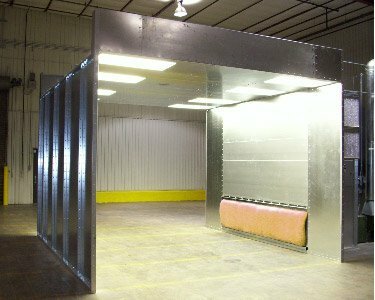 Reliant Finishing Systems manufactures over 250 standard powder spray booths, as well as fully custom booths built to client specifications. Our booth configurations are also available with matching powder curing ovens, wash stations, dry-off ovens and blast rooms. Our modular, perfectly-matched appliances are easily configured for a fully integrated powder coating line. Regardless of your finishing equipment needs–from a small batch oven or booth to a complex automated powder coating line–the specialists at Reliant Finishing Systems can help you determine exactly what equipment you need to get the best results. Let us provide you with a list of some of our very happy customers. We’ve worked with hundreds of unique layouts and design requirements, and our technicians have installed countless coating systems across the U.S.A. and abroad. When you’re ready for a new booth, oven or complete powder coating system, give us a call! This entry was posted in News on September 12, 2016 by Reliant News.